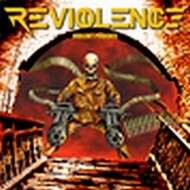 ReViolence was founded 2003 in São Paulo. After Panzer broke up drummer Edson Graseffi joined 2 guitarist and started Reviolence. The first EP In Pieces was released in late 2003 and available as free download. Within a year that EP was downloaded about 15,000 times! ReViolence became quite known in the underground. As many bands they had to go through line-up changes. Their 2nd EP is Violent Phoenix - and the band is working on their debut album. They open with the title track... A mid-paced thrashy metal tune in the beginning, but soon they speed up and tend towards old school thrash. Let me think of Forbidden... The vocals of Carlos Furtado are deep and powerful. Abduction isn't very fast, too. Heavy, sharp riffs force them ahead at this mid-tempo tune with a cool guitar solo. Well played, too. The Annunciation is a short intro for About Angels And Demons. An up-tempo tune with double leads and razor-sharp riffs. More thrashy heavy metal then pure thrash metal, even if it has some pure thrash parts. Singer Carlos varies a bit and adds some aggressiveness. Then after a break they surprise the listener with some classic Spanish guitar part - but switch back and forth with heavy riffs. Well, it will be interesting to hear a full-length album. It depends which way they will go. If they choose to go into the direction of About Angels And Demons then they will be able to draw more interest. But that don't necessarily mean that they can't add some songs like Violent Phoenix, but they have to find the right balance. I recommend to keep an eye on them.